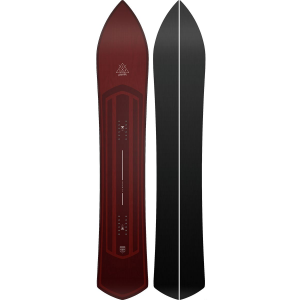 Locked and loaded with a long running length and large sidecut, the Nidecker Gun Snowboard is a true surf blaster that charges hard, lays down wide carves, and flows over every inch of the mountain with power and finesse. 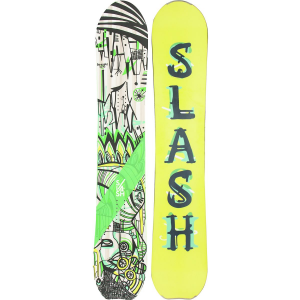 This unique beast of a board features a rockered long pic nose to help you rip up steep, choppy terrain and go fast in any type of snow, from a deep powder field to springtime slushy snow, while the positive camber and diamond tail allow you to finish your turns easily and maintain powerful response all day long. Destined for high-octane speed, the Gun's long sidecut makes for easy cruising, fast long turns, and confident control when you put the pedal to the metal. Nidecker's exclusive Nidsponsive wood core combines poplar and bamboo to achieve the ideal balance of lightness and responsiveness, while the triax/biax wrap results in confident stability under your feet and lightning-quick responsiveness. As with all of Nidecker's boards, the Gun uses ash--the best natural, light dampener material available--on the top sheet for more absorption and responsiveness.